« Captain Marvel – A Must-Watch for Any Superhero Fan! 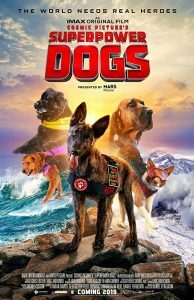 Join an immersive IMAX adventure to experience the life-saving superpowers and extraordinary bravery of some of the world’s most amazing dogs. In this inspiring true story, our best friends are also real-life superheroes. Journey around the globe to meet remarkable dogs who save lives and discover the powerful bond they share with their human partners. Follow ‘Halo’, a rookie puppy training to join one of the most elite disaster response teams in America. Meet ‘Henry’, an avalanche rescue expert in the Canadian Rockies, ‘Reef’, a Newfoundland lifeguard with the Italian coastguard, ‘Ricochet’, a Californian surf legend helping people with special needs, and the Bloodhound brothers, ‘Tipper and Tony’, who are leading the fight to save endangered species in Africa. As we discover the incredible abilities of dogs and the astonishing science behind their superpowers, we’ll never look at our best friends the same way again. KIDS FIRST! Film Critic Lukas L. comments, “This movie really shows that all dogs have super powers with their amazing senses, even if they are not trained to dig 15 feet into the snow or lift forty times their own weight.” See his full review below. I loved watching the film Superpower Dogs. The camera work is absolutely amazing with so many interesting shots and lighting angles in this 3D IMAX production. The director really worked with so many special effects to get lots of close ups and precise detailing. You really see things from the dog’s point of view, as well as its trainer’s. It is a very entertaining movie that appeals to all ages. 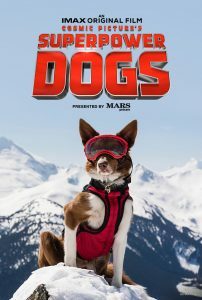 This movie really shows that all dogs have super powers with their amazing senses, even if they are not trained to dig 15 feet into the snow or lift forty times their own weight. This is a documentary so there are no actors involved. It is directed by Daniel Ferguson and produced by Dominic Cunningham-Reid, George Duffield and Taran Davies. The cinematographer is Reed Smoot. Big propos to all the crew! There are all kinds of special effects where they show us a peak of the dog’s anatomy. It is very realistic, but purposefully made as a special effect, which is so great. Also, they show a physical representation of scents from a dog’s perspective, since they have very exquisite smelling skills. It is difficult to bring smells to life but this Imax movie does it! This entry was posted on Sunday, March 17th, 2019 at 3:16 pm and is filed under Feature Film Reviews. You can follow any responses to this entry through the RSS 2.0 feed. Both comments and pings are currently closed.